Here, we go over how something as simple as adding a value to a database file can become a nightmare — and how to handle it. In my previous post, I showed how we can use a simple text-based format to store records, and what it means for reading/writing those records. Searching in such a system means that you have quite a bit of work to do because you need to scan the whole file to do so. Basically, the first column in the index is the value of the username, and those values are sorted, so searching the index has an O(logN) complexity associated with it. Once we have done that, we have the record number, and we can use that to find the position in the file and read the whole record. All in all, this is pretty basic, right? So why am I dedicating a whole post to this topic? Well, the issue with indexes would be so simple if we were planning on only doing them once. But we want to update them, and that lead to certain issues. While the index above shows only a few records, the actual data size we are talking about here is a million records. That gives us a total index size of about 16MB. What happens if we need to add a new username? In this case, a die hard fan whose username is ‘baseball’ ? Well, in order to maintain the order, we’ll have to put it between the first two entries. Which will require us to move the rest of the data by that same amount. Effectively, in order to add a single entry to the index, we'll have to write 16MB. In other words, because files don't allow us to dynamically add/remove data from the middle of the file without a lot of expensive I/O, we can't really use flat files for this. It isn't a surprise, but I wanted to start from the bare minimum and walk us up in the complexity hierarchy as we discover why we need those things. So, we need to find a file format that will allow us to update things without having to shuffle the entire file every time we do that. Looking at the literature, I can compare the flat file approach to having a sorted array, and it has the same problems. 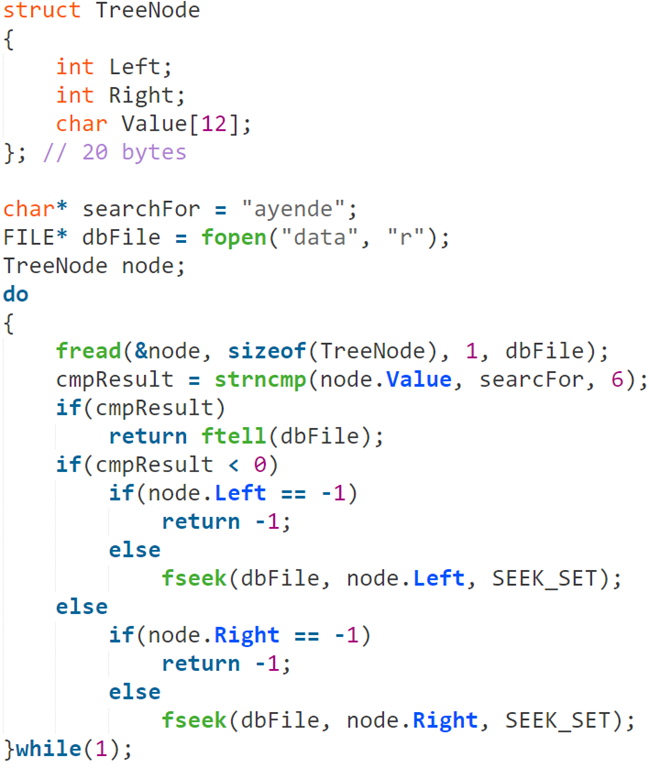 The typical solution for that is to use a binary search tree. In this way, we always have the root of the tree at the beginning of the file and use offsets to jump around in the file according to where we need to go. Note that this is with all error handling removed, and while it gives us what we want, this solution has several issues. To start with, if we want to have good performance, we'll need to balance the tree on inserts/deletes, and that can be complex. Not only that, but it also means that the number of file operations that we'll actually perform is pretty high here. This isn't good because files reside on (very slow) hardware, so we probably don't want to use that. Instead, we need to find something that will allow us to do a lot fewer seeks in the file (which takes about 10-20 ms on a standard HDD), and can handle concurrent work better (won't be fighting over the disk head position so much). We also need to make sure that the amount of work that we have to do when we modify something is minimal. In the case of a balanced tree, the amount of work to balance it can be extremely high, and the number of places you’ll have to jump around (thus, seek) is incredible. In the next post, we'll discuss persistent algorithm options here, and what we should use to store the data.